Very cute....I've only used Fusion for my plastic stuff....never thought to use it elsewhere. Thanks for the tip! Those are darling! I didn't know about fusion - so thanks so much. I love the lime green color too. You are so talented! I can't see the photo...wonder why...but have written fusion paint on my to do list! I stenciled a couple of white ones with a black design and they turned out very classy & chic for my dining room buffet. They're so much fun to work with! Love your dresser handle painting technique - I have to try it. They look fabulous when you get done! 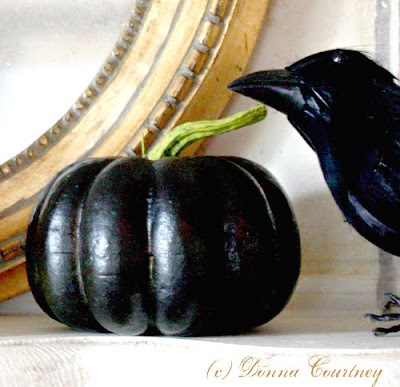 Oh I love the idea of white and black pumpkins...so out of the box. Thanks for the info about fusion! Hi Donna! Thank you for coming by for a visit and leaving your sweet comment. I was actually here when the photos were missing, but I took your advice and used the Fusion paint to redo an orange pumpkin to white. It worked beautifully. Thanks so much!!!! 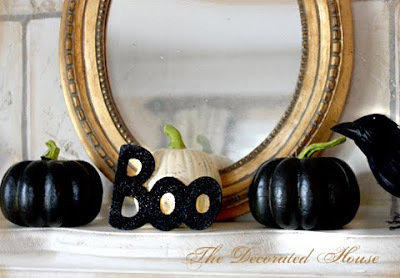 Love the idea with the black pumpkins. I love the look of black & white...I just already have a lot of orange in the mix. Sigh! Maybe in the living room I can do just black and white. Thanks for the paint tips.